Today I have the honor to Show Off a lady that I totally think is Super Woman. She is the mom of 5 small children, looks like a french model and has a totally stunning home, plus she has a fabulous blog (that is one of the most viewed and followed) where she constantly shares all of her latest DIY projects and decor ideas. Now I can't even imagine how in the world she does all of that. Then to top it all off, she just has to be one of the nicest ladies in all of blogland. So beauty, grace and talent are just a few of her attributes. I know you are going to love seeing a tour of her home, and if you don't know her, you will be totally impressed. Our home office was one of the first rooms I completed. We converted the dining room into my workspace by having a wall of bookcases built, and I found a farmhouse table on Craigslist that I use for my desk. (It also makes it pretty easy to convert the space back into a dining room, if we ever need it.) I blogged about the process of converting this room here. Our living room is an eclectic mix of some of my favorite flea market, Craigslist and thrift store finds. I also added the white slipcovered chairs and jute rug into the mix for this house to give it a lighter, more casual feel. 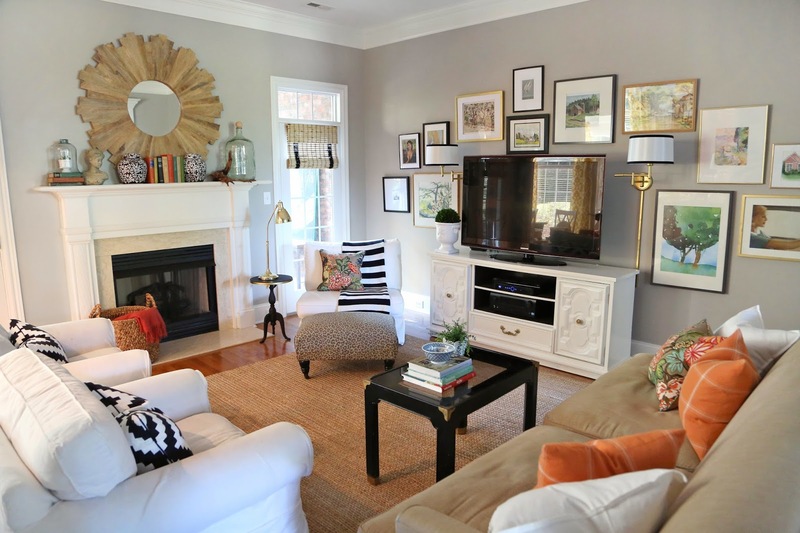 (You can see how I used some of the same pieces in our last living room here.) Lighting is always a bit tricky with an open floor plan, so I added these wall lamps on each side of the TV and filled the rest of the wall with art. 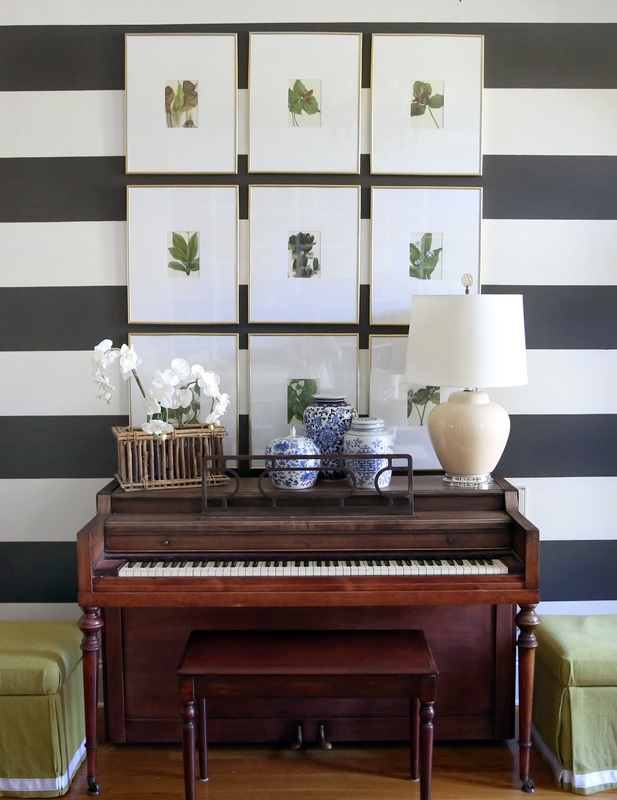 I always love a classic stripe, and brought in a bold pattern on the walls to define our open entry. Several months after moving in, we traded out a console table for a piano, which actually helps us to make better use of this space. The artwork is from an old botanical book. I bought inexpensive plastic frames, sprayed them gold and had the mats custom-cut from a seller on Ebay. 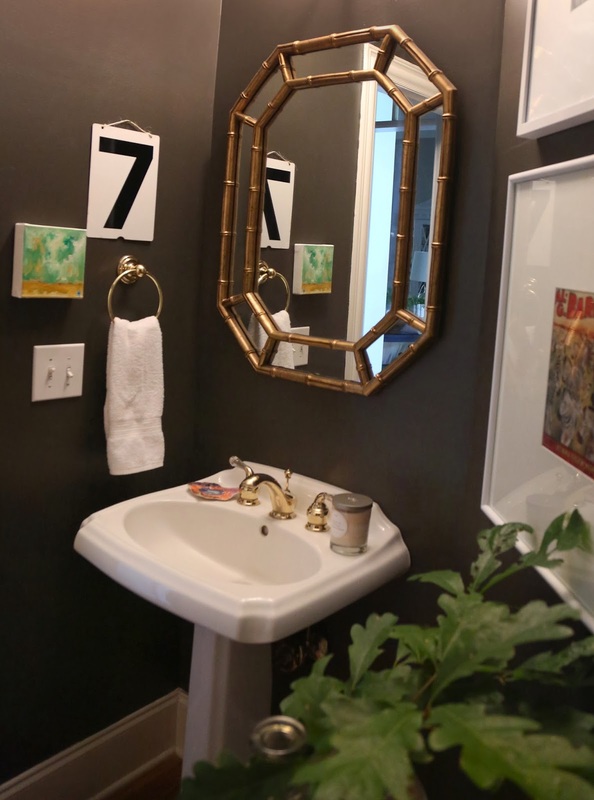 I spent months removing wallpaper in our powder room before painting it a dark gray. The mirror is one of my favorite flea market finds to date. 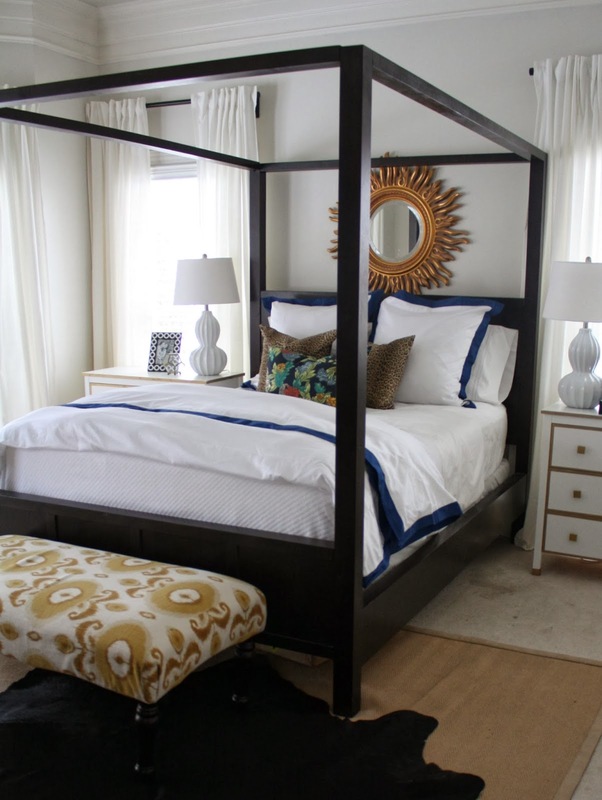 And, I’ll finish up this little tour with our master bedroom. To keep it light and bright, I layered white curtains on white walls and kept the bedding white, as well—with just a few punches of color and pattern. Our IKEA nightstands got a simple DIY gold upgrade. Thanks again to Marty for “showing me off.” You can see more of my home here. Aren't you just totally impressed. I knew you would love her style. To see more of her home and more of her fabulous projects, be sure to go by and click that follow button, you don't want to ever miss a post. Thanks tons for letting me brag about you a little, as you know, I really am one of your biggest fans. The Thrifty Groove for Thrifty Things Fri, Common Ground for Be Inspired Fri The Charm of Home for Home Sweet Home , Chic On A Shoestring Decorating for Flaunt It Fri Finding Fabulous for Frugalicious Fri ,Rooted In Thyme Simple & Sweet Fri. Jennifer Rizzo for Fabulously Creative Linky Party Redoux Interiors Friday Party, Classy Clutter for Spotlight Saturday Pieced Pastimes for Saturday Sparks Linky, Funky Junk Interiors for Party Junk It's Overflowing for Overflowing with Creativity Sat., Be Different Act Normal for Show & Tell Sat. Oh. My. Goodness! Every room Emily showed us is just beautiful. So many great blogs to see...I need to add Emily to my "follow" list. I love Emily's home! So beautiful! I always find myself drooling over her blog! That first image captured my heart! Wow how enjoyable! She really is talented and has done a wonderful job! One of my go to favorite blogs! Emily is one of the nicest bloggers out there!! I'm a big fan of Emily! Her style and home is wonderful! Emily, has a lovely style. Thanks for introducing us. I'm off to see more of her blog. Thanks, Marty! Her home is really beautiful. Thanks so much for sharing it. Very pretty home. Every room looks like it came out of a magazine. She is super woman to do all this and take care of 5 children. Makes me tired to think about it, but then I'm old enough to be a grandma. I love Emily's style and her blog. Thanks so much for sharing this Marty! Marty, thanks again for making this momma feel good :) I really appreciate you featuring my blog. And, thanks to everybody for your kind comments. Hello Miss Marty! Oh my heavens, Emily's home is just beautiful! Emily, you are one impressive momma! what a lovely home! thank you for sharing it with us at TTF this week. I hope you have a wonderful weekend! I adore Emily and her distinctive, upscale style. Is there anything this woman can't do! Wonderful post! The lamp on her office/library desk is intriguing. Is it battery operated? If not, where is the electrical cord? How does one get electricity to the lamp without a cord? I just had to stop and read this entire post when I saw the name "Emily Clark." She is the name of the character on the ABC smash hit show "Revenge" and I just love her. I don't know if her middle initial is "A" though, and she is entirely fictional. But she has a beautiful house too! I WANT that home office. Flat out WANT it. Now I have to figure out where to put it and how to afford it. 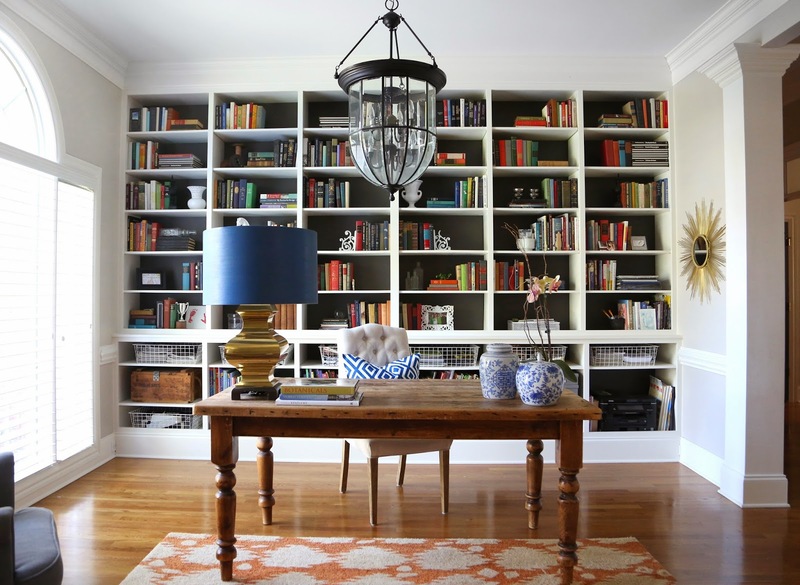 I've always wanted to do a wall of bookcases like that, and I have the books to fill them! Beautiful, beautiful. I love the master bedroom, too. I think the "chunkiness" of the dark bed perfectly counterbalances all of the white and just makes it look all snuggly comfy. How in the world can you have 5 children and your house look that perfect!! LOL Gorgeous home! Thanks for sharing on DIY SUnday Showcase!